Jennifer Britton, author of Coaching Business Builder and PlanDoTrack(TM) hosts a series of complimentary community calls she calls Virtual Book Club Calls. These are in addition to her hands-on virtual planning sessions. Download the upcoming call list here. Calls are typically held for 30 minutes on zoom. Topics are generally related to planning, productivity, and business or team development. Like this but want to take action on a regular basis? Join Jennifer throughout the year for a virtual (paid) group coaching program called the Coaching Biz Growth Lab which meets on Fridays from 3- 4 pm ET (1st and 3rd weeks of the month). We explore topics related to growing your business and accelerating your results. Questions? Reach out to Jennifer by email or phone (416)996-8326. Next Call: Monday December 17 - Launch Call - PlanDoTrack (for Virtual and Remote Professionals) - 11-11:30 am ET (We meet in zoom room 270-302-0415) ** Subject to change - Calls will always be posted closer to the date at my Effective Group Coaching Facebook Page. Looking to participate in real-time productivity and business development support. Join Jennifer for a shorter 45 -60 minute business planning hack or month end reflection session. More here. 90 Days PlanDoTrack Virtual Retreat Sessions will run throughout the end of 2018 and 2019 These are 4 hour virtual planning retreats geared to support you in PLANNING, DOING and TRACKING. Learn more here and reserve your spot. Join Jenn for the first of a series of regular Virtual Book Club Calls. These complimentary community calls are geared to take you inside the covers of the Coaching Business Builder Workbook and planner. Each call focuses n on different business development and planning topics for coaches. Join Jenn for an upcoming Virtual Book Club call. They are 30 minutes and free. Download the call schedule. Looking for tools for your fall planning and business development, coaches? 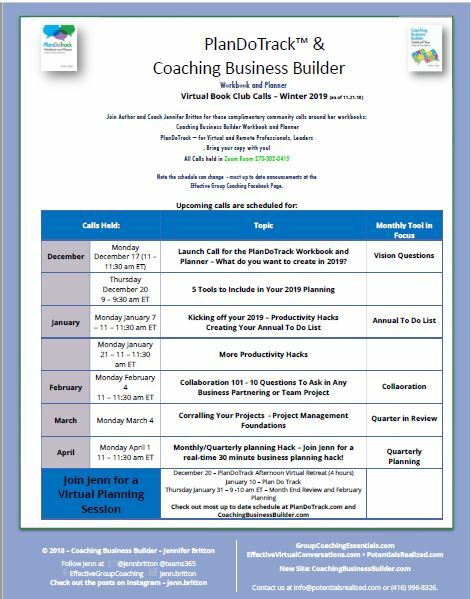 Jennifer takes you inside the cover of the Coaching Business Builder Workbook and Planner for this 30 min virtual book club call. She covers 5 essential tools to use for planning, tracking and content creation. 30 minute call. The September 6 2018 call was the 4th in the Virtual Book Club series. Jenn dips into pages 23-28 of the Coaching Business Builder, getting you to consider some of the habits and mindsets that are shaping your business behaviors and results. As you step back to work this fall, what habits are important to cultivate? Jennifer also reminds you of the Monthly Trackers which are a great resource to support you in tracking your actions, and noticing patterns. Jennifer's 6th Virtual Book Club call focuses on 9 Different Promotional Vehicles you might want to consider in letting others know about your coaching business. Be sure to have pen and paper or your journal with you as Jenn walks you through two short exercises to support you in identifying which strategies you might want to explore. It's the start of a new month so be sure to start tracking your progress, and content, using the Content Trackers. Also be sure to follow Jennifer's current #90DaysPlanDoTrack series over on Instagram at the CoachingBizBuilder feed. I hope you'll join me for a future call as a I take you through the book.